A blood transfusion is a common procedure which is undertaken to replace blood that might be lost during surgery or due to serious injury. It is also performed when your body is unable to make its own blood properly because of an illness. The first thing that must be done before a blood transfusion can be carried out is to test your blood to find out your blood group. This is important because although people who have certain blood types are able to receive blood from any blood group, others are only able to receive blood from their same blood group. If the wrong type of blood is used in a transfusion that doesn’t work with your own blood type, antibodies in your own blood will start to attack the new blood which will cause you to feel sick. This rarely happens though because of the testing procedure first which involves pricking your finger with a needle to obtain a few drops of blood from which your blood group can be ascertained. Blood transfusions will usually take between 1 and 4 hours. Depending on the nature of why you’re receiving the transfusion, you may be under general anaesthetic at the time because of an operation you’re going through or you might be fully conscious as there is no pain involved as a result of the transfusion itself. A needle is inserted into one of your blood vessels and through this intravenous line, the new blood will be pumped into your body. It’s usually a very straightforward process, although if you’re having a transfusion because you’ve lost a lot of blood as, say, the result of a serious injury, it can sometimes present complications. However, regardless of your condition at the time of transfusion, you will be carefully monitored throughout the duration of the transfusion for things like your blood pressure, temperature and heart rate. Following a blood transfusion, the only physical indication you’ll get that a transfusion has taken place is that you may suffer from a little bruising and soreness around the site of where the needle and IV was inserted. You may also need to go for several blood tests following the transfusion just to determine how your body is reacting to the new blood. 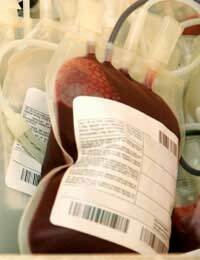 We’re all familiar with the 'horror stories' of cases where people have contracted the likes of the HIV virus or hepatitis as the result of receiving contaminated blood during a transfusion but, thankfully, because of highly sophisticated screening techniques, the chances of either of these happening are extremely minimal.